It’s taken me an age but since my post back in January about maybe wanting to ride my bicycle, I’ve finally decided I definitely want to ride my bicycle. So much so, I bought a bike and cycling helmet. 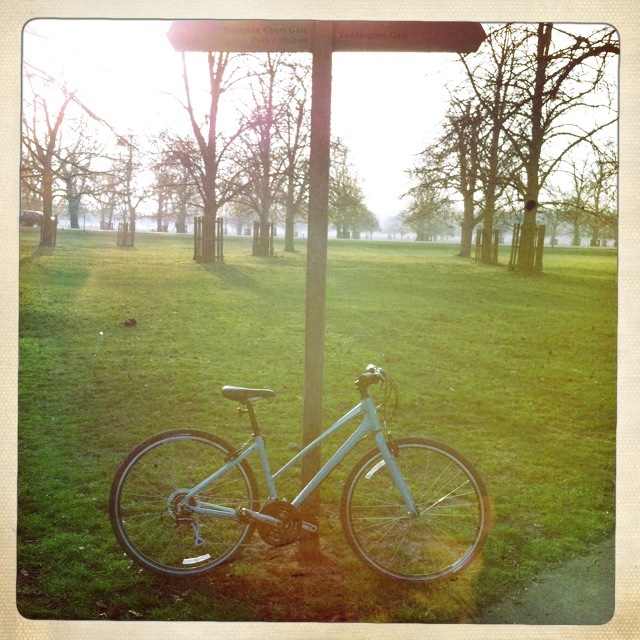 After wobbling along by the side of the Thames and around Richmond Park with my trusty helmet on, I even plucked up the courage to ride on the road and, rather amazingly, didn’t get honked at. There were tears at one point when I bumped down on the crossbar a little hard and there may have been a mini-tantrum when I couldn’t get up a hill, but other than that I really enjoyed cycling around. My husband had fun too, insisting on me wearing a hi-vis vest and tucking my trousers into my socks and then shouting “Nerd!” at me round Richmond Park. So, buoyed up with a false sense of competency I signed up for Cycletta’s ride at Woburn Abbey in Bedfordshire on 13th May. I didn’t just sign up for the 40km. Oh no. I signed up to do the 60km ride. Having ridden a bike a grand total of four times in the last twenty years it may not be my smartest idea, but I’m going to invest in some padded trousers and give it my best shot. Cycletta organise seven 40k bike rides a year around the UK that are open to women only and cost about £45 to enter. Although fairly pricey, the routes are traffic-free and well marshalled with a ride rescue crew that come and help out if you get into any problems. There are plenty of free things after the ride like goody bags and pamper sessions. Fancy keeping me company? P.S. I’ve chosen to ride for Tommy’s, the baby charity who have a target to halve the number of babies that die in pregnancy or birth by 2030. I’m hoping this will motivate me and stop me from chickening out on the day of the ride. If you’d like to sponsor me and help Tommy’s with their research, click through to my Just Giving page.